Some of the most beautiful flowers of the summer garden are produced by vines. Because vines climb, the flowers are often produced at eye-level or overhead, allowing the gardener the chance to easily smell the fragrance or closely examine the details of the blooms. Vines climb in two distinct ways – by twining and by clinging. Twining vines climb by wrapping their stems, leaves or tendrils around a support. They must have string, wire, latticework, trellises, poles or other support structures they can twist around. Clinging vines can attach themselves to flat surfaces using roots along their stems or special structures called holdfasts. They are useful for covering the sides of buildings or walls without having to build a support. It is very important to know how a vine you intend to grow climbs. The following perennial vines are wonderful choices for Louisiana gardens and will thrive even during the blistering heat of our summer. They are best planted in full to part sun. The delicate sprays of small rosy pink flowers that adorn rose of Montana (Antigonon leptopus, also called Rosa de Montana and coral vine) are unique and delightful. Flowering may occur all summer but is generally most abundant in late summer and fall. This native of Mexico generally freezes back during winter but grows rapidly from its roots in spring. It’s excellent for an arbor over a patio where summer shade is desirable, but the sun is able to shine in during the winter. The light-green foliage of this twining vine is oval, attractive and never bothered by serious pest problems. Coral honeysuckle (Lonicera sempervirens) is an outstanding native that is remarkably well-behaved as vines go. 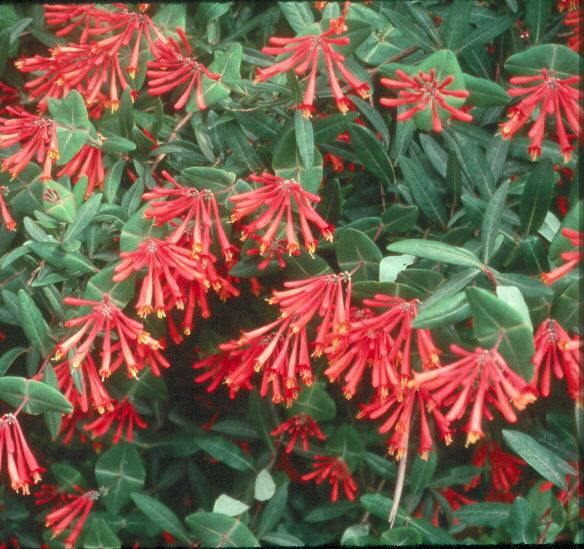 The tubular coral-red flowers are produced in clusters at the ends of shoots that often dangle gracefully from this twining vine. The evergreen foliage is a distinctive blue-green with silvery undersides. Flower production is generally heaviest in early summer but continues throughout the season. The attractive, but scentless, flowers are irresistible to hummingbirds. Clematis vines produce some of the most beautiful early summer flowers. Unfortunately, most of the especially beautiful ones are difficult to grow in Louisiana due to our long, hot summer. Still, they are worth a try if you are up for a challenge. Provide morning sun with afternoon shade. Sweet autumn clematis, Clematis terniflora, is a very reliable vine that covers itself in white flowers around late July and August. The resemblance of evergreen wisteria (Millettia reticulata) to Chinese wisteria is quite noticeable. Less unruly than Chinese wisteria, the evergreen wisteria is still best used in situations that provide it with plenty of room to grow. With its dark green, shiny foliage and dangling clusters of deep purple, fragrant flowers, this twining vine looks outstanding on arbors, pergolas and fences. Akebia (Akebia quinata) is another outstanding choice for arches, arbors and pergolas. This twining vine has slightly glossy, five-part evergreen leaves that are dark green and provide a beautiful background for the clusters of dusky purple flowers. The flowers are most numerous in April and May but continue to appear all summer. The sweet fragrance they produce permeates the air around the vine but is not overpowering. I must mention some of the annual vines that bloom in the summer garden. These twining vines generally live for only one season and must be replanted from seeds each spring. In particular, I would not be without the hyacinth bean (Dolichos lablab). Purple stems hold purple-tinted, three-part leaves and long spikes of lavender and purple flowers. The flowers are followed by shiny, purple bean pods that are edible when young and flat. Two vines related to each other and similar in appearance are the cypress vine (Ipomoea quamoclit) and cardinal vine (Ipomoea multifida). I love to let these delicate twining vines weave themselves among other plants and climb up small trees and trellises. They tend to self-seed, so watch for seedlings, and don’t allow them to grow where they are unwanted. The moonflower vine (Ipomoea alba) is the queen of the evening garden. This vine rapidly unfurls large, fragrant, white flowers at dusk, and the large heart-shaped leaves form a wonderful background. This large vine grows luxuriantly in the sultry Louisiana summer and is perfect when planted by a patio or in a container on a balcony. Vines add so much to our gardens it would be hard to imagine doing without them. The vines mentioned here are only a few of the many that will delight you with their brilliant flowers and long blooming season. Just remember, vines, bless their hearts, have no self-control. When your invite these charming plants into your garden, you must be prepared to control and guide their enthusiasm.